The ProForm 415 LT Treadmill is a treadmill meant for both gym and home use. This treadmill offers quality new features like the iFit Weight Loss Program with Jillian Michaels and the blue tinted LCD screen for easy viewing. The Proform brand has a long list of treadmills available on the market, but the 415 LT is very unique because of its new additional features, including the cushioned platform for running. This treadmill became available back in 2013, and it is priced at an affordable $600 on Amazon. 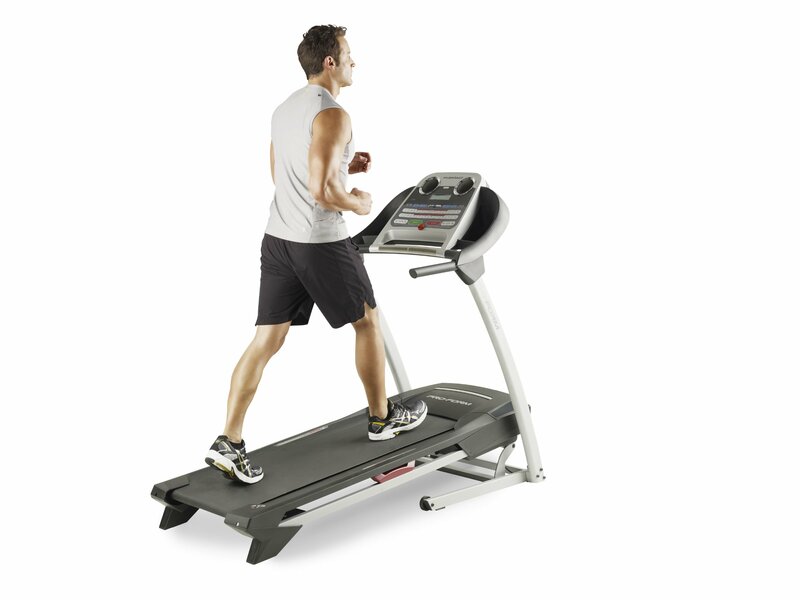 One of the main features of the ProForm 415 LT Treadmill is the TreadSoft cushioning for running. Gone are the days of pain in the ankles because of the shock found from running. This treadmill makes it so light on the feet. The platform is properly cushioned so your feet, no matter how hard the impact, continues running without shock to your ankles. Running on concrete floor outside is painful on the knee without the right shoe, but this treadmill takes care of this problem. America’s toughest trainer is coming to your home, because this new treadmill offers an 8 week program of complete training from Jillian herself. With an additional 12 workout apps, you’ll always be motivated to workout and get in shape, making it perfect for those who need that extra push. It has a blue tinted LCD that makes it easy on the eyes when choosing your workout when running. There is a music port for your iPod to listen to your favorite songs while working out. You have the option to change up your workout to go harder or a bit easier when you’re tired. There are Quick Incline Controls that let you go neutral or run upwards to make it even more difficult. The QuickSpeed feature let’s you run quicker or slower. It has a Dual Grip EKG Heart Rate monitor to find how hoe your heart is doing while running. This treadmill is known for being able to conserve space when not in use. In fact, you could fold the entire treadmill, close it, and roll it into your closet or to the side of the room. When you’re tired of working out, you just use this feature to fold it up and hide it away. It’s very helpful on conserving your room space even if you have a small home. You can be up to 300 lbs. and still be eligible to run on this treadmill with no problems. There is a 2.0 CHP Mach Motor that allows people who are overweight to run with no problem. It still has the capability to cushion the ankles for the people at this weight using the TreadSoft cushioning. This was built for people of all sizes to get in shape. It Can Be Slower To Run If You’re At 300 Lbs. The ProForm 415 LT is actually a bit slow for the treadmill’s platform to move if you are at the peak of the 300 pound weight limit. The key to eliminating this is to walk on it for ten minutes for the platform to get a little looser before running or jogging on it faster. When you first buy the ProForm 415 LT Treadmill, it’s a little tough to fold it in half to save space. However, once the folding mechanism has been folded a few times, it irons out the kinks on its own and gets softer to fold. Despite its slight drawbacks, the ProForm 415 LT Treadmill is a quality treadmill at an affordable price. It brings such great safety precautions for all users to avoid any accidents from occurring. It is quite a simple treadmill that isn’t so highly fashioned the way others are, but it has all the right features to function well enough to get in shape, and isn’t that all you want? Should you buy this? If you want a good treadmill that functions well, runs easily, and can be put away at a moments notice, this treadmill by ProForm is definitely a worthwhile investment.